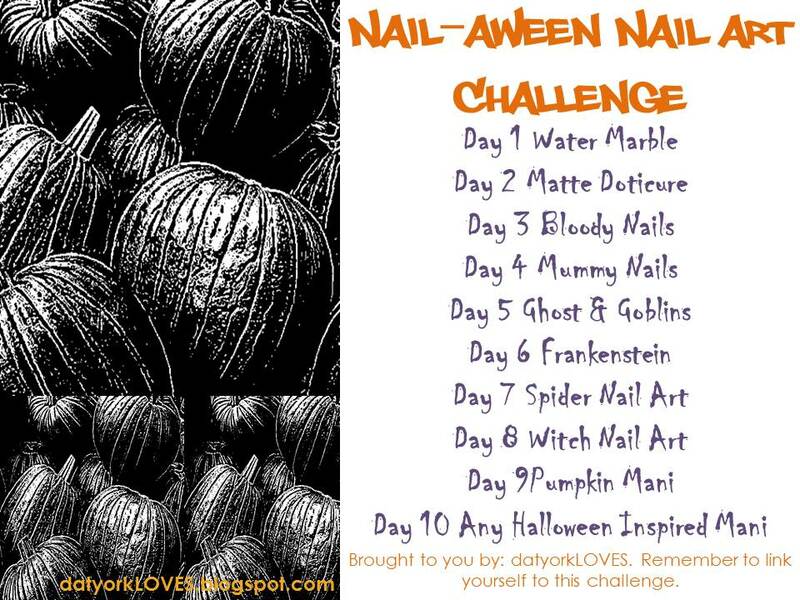 So this is my Day 2 post for the Nail-aween Nail Art Challenge from datyorkLOVES/Sassy Nails. There are 10 themes, and I have to complete all of them by the end of October, but other than that, it’s self-paced. 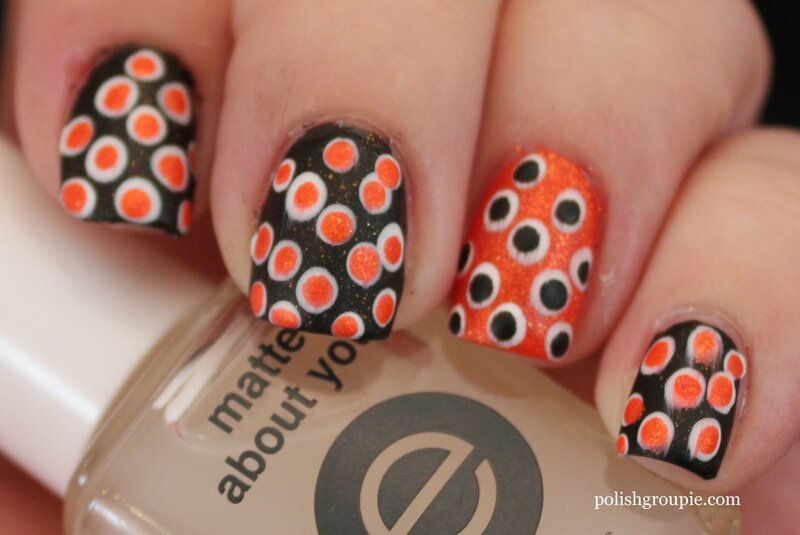 Today’s theme is a matte dotticure. I was really happy with the way this one came out, and it was really fun to wear. I started with two coats of Orly Liquid Vinyl on all of my nails except my ring finger, which is two coats of China Glaze Riveting. 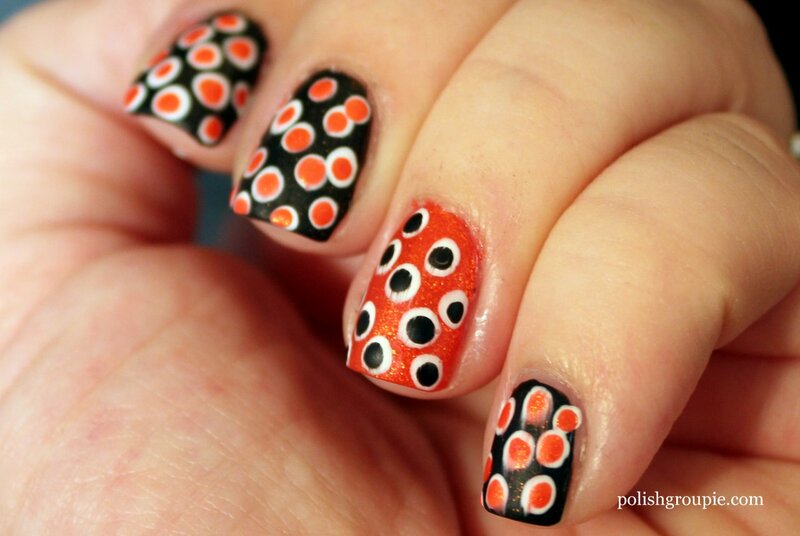 I added one coat of Poshe quick-dry top coat. 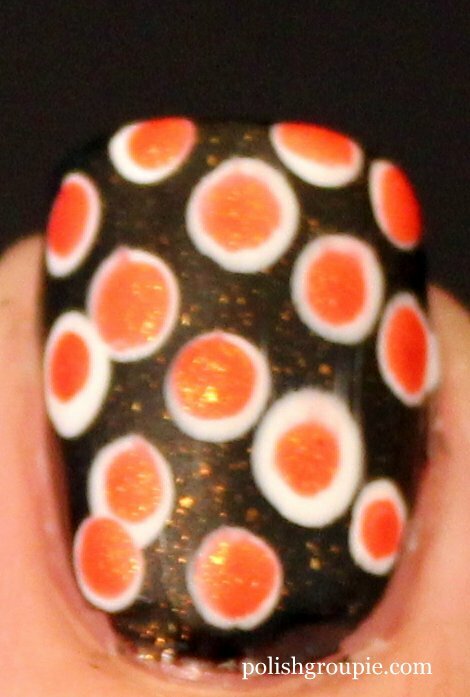 As I did, some of the China Glaze Riveting transferred to the brush and then to my nail as I was painting the next black nail, and it left behind a bit of the orange shimmer. 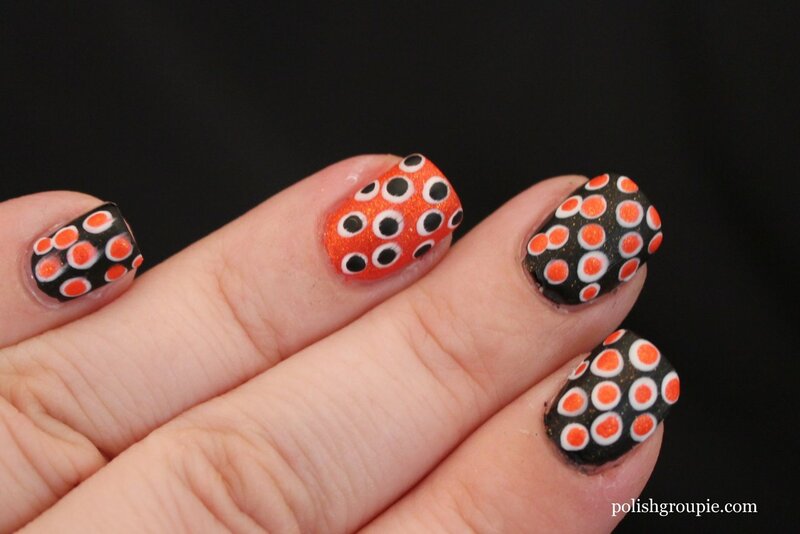 I really loved the way it looked, so I decided to do some minor frankening: I mixed a bit of the two colors together on some wax paper and then painted that on top of the black nails so they’d all have a bit of the orange shimmer on them. Topped all of that off with Poshe when I was finished. Then I added dots. 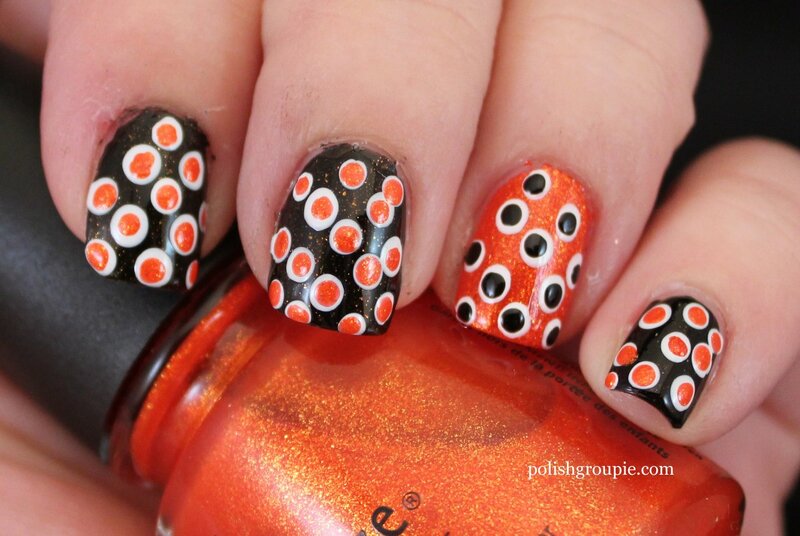 I started with Ulta Snow White dots using the head of a pin, then used a small dotting tool for the inner dots: black on the orange nail, orange on the black nails. 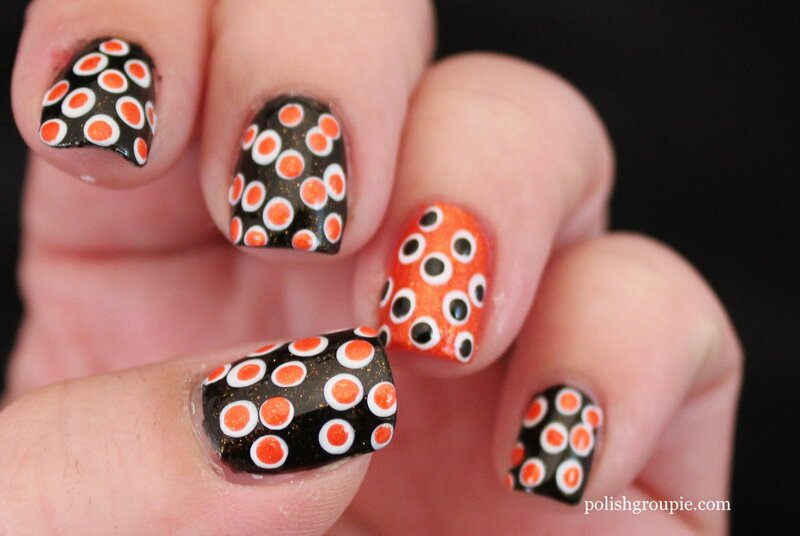 The accent nail almost looks like a bunch of googly eyes, don’t you think? To make it matte, I added one coat of Essie Matte About You. 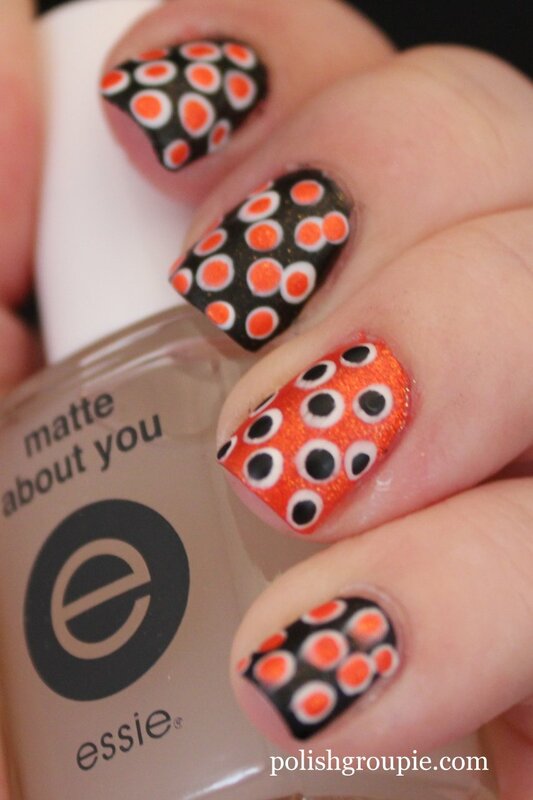 Unfortunately I didn’t let it dry long enough before I applied it, and it smeared some of the dots. 😦 The matte effect wasn’t very strong, perhaps I needed to add more. Here’s a look at the manicure before I added the matte top coat.